Set within the tranquil and balmy confines of Tarragona, the holiday camping site of Park Playa Bara is perfect for those who wish to get away from it all and experience an unforgettable sense of Catalonian luxury. Please contact LUX-camp for additional details and rates. This campsite does not accept 2 families travelling together. Therefore, we can unfortunately not accept any preference for accommodations together. A warm climate throughout the year. A plethora of modern conveniences. Quality and modern mobile homes. A proximity to picturesque Mediterranean beaches. Luxury camping is now a reality thanks to the host of features and facilities that this holiday camping site is able to provide. All sanitary locations are able to handle the needs of those who are handicapped and baby changing rooms are available for those who are bringing along infants. Wireless Internet is a standard feature and there are dedicated water and power supplies for the mobile homes. In fact, there are even sanitary locations specifically designed for dogs, so feel free to bring them along too. 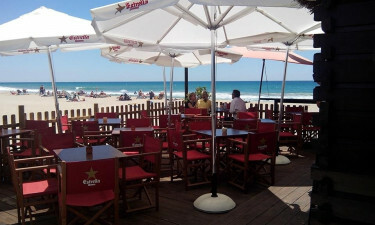 Tarragona is known for its truly amazing summer months. However, it should be noted that the temperatures at this luxury camping site are quite agreeable during the autumn and winter as well. Catalonia itself has few rainy days and, therefore, the beaches can always be accessed when other locations in Europe would prove to be decidedly too cold. Because of this, open-air activities such as hiking and bicycling can be enjoyed without any hindrances. There is certainly no lack of things to do when arriving at Park Playa Bara. 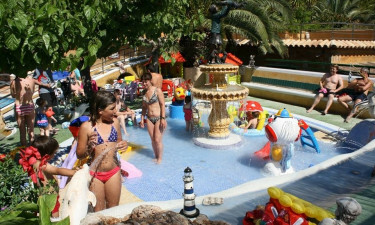 This holiday camping site provides a wide variety of activities to enjoy. 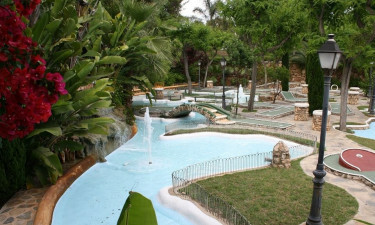 Some examples here include an open-air pool with a water slide, table tennis, volleyball, miniature golf and a play area designated for children. There are other options located only a short distance from camp such as a golf course, sailing and bicycle hire for local excursions. The food and drink to be enjoyed during this camping holiday are not to be missed. Thanks to a restaurant and a grille that are both located only minutes from one's mobile home, dining out with the family could not be more convenient. During the warmer months of the year, experiencing a night out under the stars with a cocktail from the bar is also a great way to enjoy a break from the world. 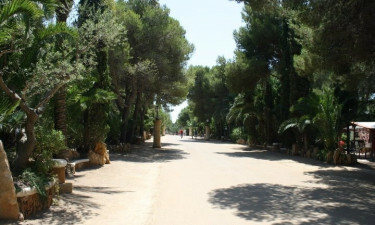 There are also several retail outlets located within this luxury camping site. These include a supermarket (for produce such as fruits and vegetables), a bakery, a souvenir shop and even a location that sells international newspapers. There is a cash point found within this complex for shoppers' convenience. So, stocking up on foods, gifts and camping essentials is effortless, meaning there is more time for swimming, sunbathing or undertaking any other fun activities.